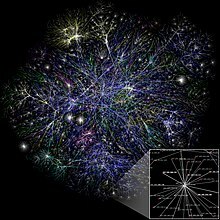 Connection [variant of British English connexion, from Latin connexionem (nominative connexion ‎(“a conclusion, binding together”), from connectō, an alternative spelling of cōnectō ‎(“I bind together”), from compound of co- ‎(“together”) and nectō ‎(“I bind”)] refers to any means of contact or joining, associative relationships, or regions of unity or identity amidst and between objects or other entities. She might yet be able to help him to the building of the rainbow bridge that should connect the prose in us with the passion. Without it we are meaningless fragments, half monks, half beasts, unconnected arches that have never joined into a man. With it love is born, and alights on the highest curve, glowing against the grey, sober against the fire. Happy the man who sees from either aspect the glory of these outspread wings. The roads of his soul lie clear, and he and his friends shall find easy-going. Hardship is vanishing, but so is style, and the two are more closely connected than the present generation supposes. Whatever, in connection with my professional practice, or not in connection with it, I see or hear, in the life of men, which ought not to be spoken of abroad, I will not divulge, as reckoning that all such should be kept secret. There is not one of you whose actions do not operate on the actions of others — operate, we mean, in the way of example. He would be insignificant who could only destroy his own soul; but you are all, alas! of importance enough to help also to destroy the souls of others. ...Ye cannot live for yourselves; a thousand fibres connect you with your fellow-men, and along those fibres, as along sympathetic threads, run your actions as causes, and return to you as effects. Henry Melvill, in "Partaking in Other Men's Sins", an address at St. Margaret's Church, Lothbury, England (12 June 1855), printed in Golden Lectures (1855); eventually part of this statement become paraphrased in several slight variations, and has usually been misattributed to Herman Melville, i.e. : "We cannot live only for ourselves. A thousand fibers connect us with our fellow men; and along these fibers, as sympathetic threads, our actions run as causes, and they come back to us as effects". Academe needs deprofessionalization and deyuppification. It has to recover its clerical or spiritual roots. Scholarship is an ideal and a calling, not merely a trade or living. Every year at commencement, we put on medieval robes that connect us to a great monastic past. The thing that we are trying to do at Facebook is just help people connect and communicate more efficiently … Think about what people are doing on Facebook today. They're keeping up with their friends and family, but they're also building an image and identity for themselves, which in a sense is their brand. They're connecting with the audience that they want to connect to. It's almost a disadvantage if you're not on it now. This page was last edited on 18 June 2017, at 21:40.